The student gets high scores on the LSAT PrepTests. The student feels good. The student feels confident. Yet, on test day, the student fails to come close to his or her target score. The student feels defeated because he or she must devote even more time to retaking the LSAT. Wasted time and debilitating frustration are not the only concerns. With courses costing hundreds to thousands of dollars, not to mention the $160 that it costs to merely sit for the LSAT, money is at stake too. I took my first LSAT in the Philadelphia Convention Center. Labeling it a distracting environment would be an understatement—it was an open room of about 200 students. On top of that, the Convention Center staff was preparing for a concert that would take place that night, and there was constant noise in adjacent rooms that shattered my concentration. A proctor who strictly times you by telling you when to start and stop, who screams out the five-minute warning, who is always in your presence, and whose eyes burn right through you as you are taking the second most important test of your life (first being the bar exam). The feeling of the test being the “real deal”: being read the instructions before the test starts, having only thirty seconds between sections, being allowed only a strict ten-minute break between sections three and four, having to wait for the proctor to collect test materials and ID’s before and after the break, and taking the writing sample, which is more important than people realize. (See The LSAT Writing Sample Matters). These three factors were the recipe for the SimuGator LSAT Proctor DVD, which Mike helped create between his first and second LSAT administrations. The DVD is the only professionally-produced full-video simulation of the LSAT. To date, the DVD has helped thousands of students successfully prepare for the LSAT. Mike was one of them. As my story shows, the LSAT Proctor DVD was truly a creation of necessity. I used it myself while studying for my retake. By pushing play once, I was immersed in a realistic test-day environment. To make a long story short, my score increased by ten points. Thereafter, I was accepted at my first-choice law school in my beloved home state, received a large merit-based scholarship because of my LSAT score and GPA, served on my school’s Law Review, passed both the New York and New Jersey bar exams, and secured a great judicial clerkship after graduation. None of this would have been possible if I did not score ten points higher on my LSAT, which was a direct result of using my own product, the LSAT Proctor DVD. 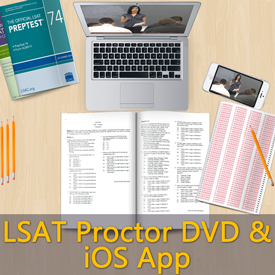 Click here to learn more about the SimuGator LSAT Proctor DVD.